Though the power of your old battery may have faded away, sticking that used battery in a dark corner of your garage won’t make it disappear. So instead of holding onto it, recycle it. Recycling saves resources because the recovered plastics and metals can be used to make new batteries. 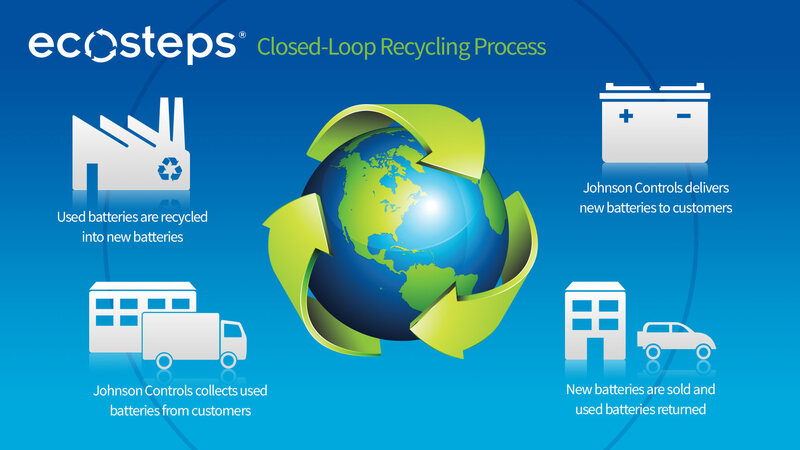 The fully integrated, closed-loop recycling process from Johnson Controls, known as ecosteps®, ensures batteries are recycled safely and responsibly. The recycling process is simple. Lead is formed into lead ingots, which are then melted down again to form the lead plates and other lead components of the battery. The polypropylene is formed into pellets that are then made into new battery cases. The old battery acid is processed and converted into sodium sulfate, which is used in detergent, glass and textile manufacturing. Powering the world. Protecting the planet. ecosteps® is the responsible, sustainable way to recycle batteries.